You Can't Teach an Old Frog New Tricks - The Chip's Challenge Wiki - The Chip's Challenge Database that anyone can edit! The extra clone buttons on the way are connected to this clone machine. 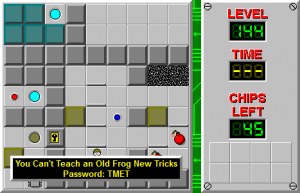 You Can't Teach an Old Frog New Tricks is the 144th level in Chip's Challenge Level Pack 3. It was famous for its unprecedented complexity and difficulty long from the very introduction of the level in Madhav Shanbhag's KeyboardWielder.dat: the solution requires an almost endless array of puzzles with often unusual, convoluted solutions that have to be set up such that a teeth can move through them without being killed, as it is required to fully solve many of them. Most of the puzzles are arranged such that the teeth will chase Chip according to a single, fixed position - inside a trap - and the goal in that sector being to get the teeth all the way through to release the brown button. Hints to this goal first appeared on April Fools' Day 2010, and also feature in the CCLP3 storyline. 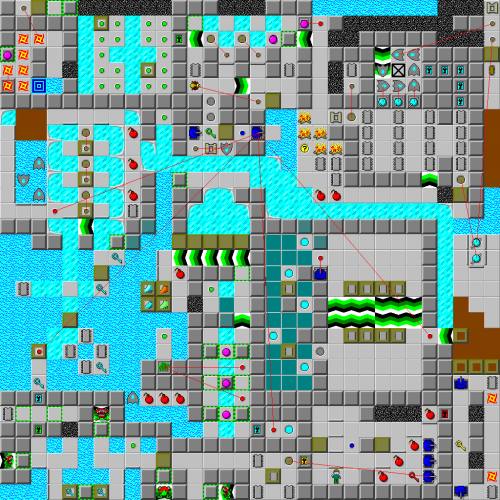 This level is one of the three untimed levels in CCLP3 due to its complexity. This comes as a relief to many competitive players, since parts of the solution involve several random elements, and many believe this to be the reason for the level being untimed. However, the designer has denied this. These random elements do not have any effect on the casual player as they won't kill Chip or cause the level to be cooked. To complete this level, push a block to a blue button to remove one tank. Then take the red key and use the block to remove the bomb, open the red lock and take the yellow key. Open the yellow lock, the use a block to explode a bomb and use another block to trap the lowest tank. Press the blue button, then run west. Push the block and press the green button. Take a blue key from one of the block. Enter the water room. To toggle the toggle wall, Chip has to deflect the glider into the green button using dirt and two chips. In the next room, Chip has to use blocks to explode the bomb and then release three glider. Take the chip and slide into next room. In this room, Chip must make a maze for fireball, but the fireball has to slide in all south force floor. Enter the blue wall room. Use partial posting to enter the next room (Don't remove blue wall UR from teleport 4). Press the red button to clone a blob that with 1/3 or 1/4 chance will toggle the toggle wall. Build a bridge to the toggle button then press it. Take only chip 3 then release the glider. In the walker clone machine room, take all chip except for the most northwest chip. Release fireball to force floor and walker room. Take chip in the water room (toggle the toggle wall first). Open the blue lock in walker room. Press the blue button then block the lower tank with a block until the lower tank is R 3U from the gravel. Toggle the toggle wall then go to the north room, pressing a brown button that clone walkers in progress. Release the bug to release you from two trap. Go to the center room, take the green key and open the socket. Open the most north west socket to stop the walker cloning. Open the green lock in the teeth room then go back to center room. Push the block to a blue button and step on a trap. Wait for the teeth to release you. In Tile World 2, when using playback mode, it's possible to see how the teeth moves through the level: It exits the teeth room (after the tank blocking it moves right and returns to where it originally was) to move through the ice passage, provided Chip didn't remove any dirt that keeps it from falling into water, and enters the glider room. As the teeth presses the brown buttons, the gliders free each other one by one in a chain sequence so the last of them can free the teeth when it moves onto a previously occupied trap, in a successive way until it moves onto the ice road that takes it to the block chamber. Provided that the blocks were properly placed, the fireball lured to this area can bounce through them to help the teeth move step by step towards the western teleport maze (since the force floors would otherwise leave it stuck forever); once there, the teeth moves carefully through the teleporters so it appears in the pink ball chamber, where the teeth will continuously clone blobs so they can press the toggle button and make the pink balls move sideways to allow the teeth move north towards a corridor whose force floors will move it through where Chip is awaiting. Once the teeth presses a green button, it can enter where Chip is and press the nearby brown button to disable the trap and free him. After released, guide the teeth to the walker room. Release the fireball when the teeth is next to the fireball. Then release the teeth and use the teeth to release you in the north room. In the final room, Chip has to use the teeth to toggle the toggle wall so you can press the brown button using block. Then trap the teeth between two block so the fireball doesn't clone again, this will be see this again in Mr. McCallahan Presents. Then enter the exit. The level has received both extreme positive and extreme negative feedback from the community. Some have opined that it is "more of a spectacle than a level". A few have expressed frustration at the inability to figure out what exactly went wrong when an attempt does not go as expected (although this is also true of some other levels, and the tank cloner in this level does provide some indication of progress). Most of the current public solutions use an inferior strategy for handling the blocks in the ending room, which then requires the player to negotiate slide delay in MS mode. This has led to further raging that the solution is unfair. But with a slight change by using a better thought out strategy, the intended solution is relatively easy to execute. In Tile World 2, playing back the solution focusses on the teeth for the duration that Chip is stuck on the trap. Some commentators refer to this as the "teeth cam". This feature is achieved by hard-coded values in TW2's code, and cannot be employed in general for other levels. It deliberately operates only during playback of a successful solution, and not when playing the level, so that the playing rules remain unchanged and no undue advantage is provided by using TW2 as compared to TW1 or MSCC. The level also includes all 4 boots, but they are buried under blocks and hence not accessible. In response to a thread at CCZone, the designer posted a levelset displaying different versions of the level as it evolved from its initial concept to completion. This page was last edited on 13 March 2019, at 01:31.